At first he cuts the sheet into two rectangular sheets by horizontal or vertical cut. Then he takes one of the obtained sheets and cuts out two equal non-overlapping circles from it. Let the radius of each circle be R.
Finally he cuts out the rectangular sheet of the size 2πR × A for maximal possible A from the second sheet, with sizes parallel to the sides of the second sheet. He will use it as a lateral surface of the container. Namely, he rolls up the obtained sheet along the side 2πR to obtain the lateral surface of cylinder. Thus, Chef obtains the cylindrical container of height A and radius R, having bottom and top made from steel. Chef is aware of your advanced math abilities and asks you for help to find the optimal container. Output the maximum volume of the container that could be achieved by the above scheme. The first line of the input contains an integer T denoting the number of test cases. The description of T test cases follows. The only line of each test case contains two space-separated integers W and H.
For each test case, output a single line containing the maximum volume of the container. Your answer will be considered as correct if it has a relative error less than 10−11. More formally, if the correct output is A and your output is B, your output will be considered as correct if and only if |A − B| ≤ 10−11 * A. 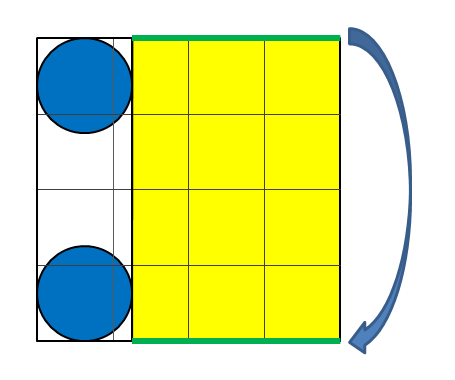 In all examples blue circles are top and bottom of container. 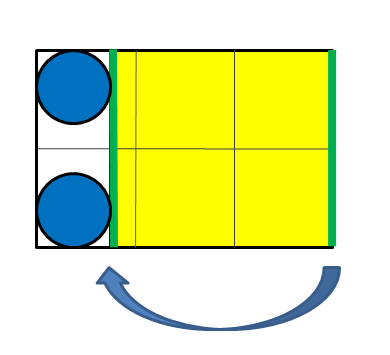 Yellow rectangle is used to create lateral surface. Namely, we roll up it along the direction of blue arrow to match green borders. R ≅ 0.63662, A ≅ 2.72676. R ≅ 0.36218, A = 2. R = 0.5, A = 1.